“[I] felt like a rhino myself, an ungainly creature put together from different parts. Part Eastern. Part Western. Part city slicker and part jungle dweller. Part scientist and part drunken singer of bawdy songs. Part hunting guide and part preservationist” (202). Through the challenge of saving this species from extinction, he finds a balance between these dichotomies and a way to use the differences in a beneficial manner. Nepal becomes an area where Western culture meets Eastern culture. Like with our own travel to Nepal, it is important for those entering a new space to understand the different preexisting system in place and the relationships between them. In this novel, first there need to be an understanding of the local people’s concerns and to create positive change. The aim was for the local community to see the bond between human wellbeing and animal, specifically rhino, wellbeing. So instead of community members posing the question if rhinos were more important than the people of Nepal, individuals like John Coapman, a Texan, worked to establish a codependent relationship between humans and wildlife (81-82). Coapman saw an opportunity to switch guns out for cameras and it work. 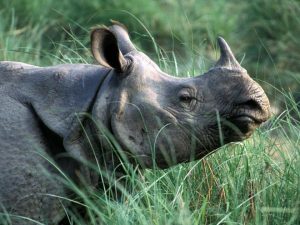 Though having flaws, adventure tourism in Chitwan improved international conditions, brought more economic wealth to the area through the new business, and begun to change the perception of rhinos as pests. Nepal blends modern and traditional cultures which Mishra describes as the “drive toward modern life versus the effort to preserve traditional culture” (149). This can be seen all throughout the country from the 16th century medieval brick buildings with electrical and telephone wires, to the high-quality climbing gear next to Tibetan refugee woven rugs, and the fancy cars in the narrow streets of Kathmandu (149). The practice of relocation rhino also blends modern sciences such as radio telemetry and high-powered dart gun holding sudation drugs with traditional practices such as shamanism rituals towards the Goddess of the Forest, Ban Devi. Even the King Birendra was affected by the clashing and blending of cultures. 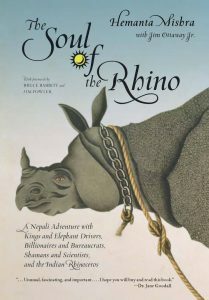 Receiving an international education and knowing the fragile state of the rhino population, the king struggles with the pressure to perform a Nepalese traditional involving killing a rhino, Tarpan. When Mishra is charged to be the hunting guide for the Tarpan, he grapples with the ethics of this religious ceremonial obligation and the moral ethic of killing even one rhino. This situation shows how conservation is not as straight forwards as it might seem and how other aspects are important in creating a sustainable environment such as building local and international community support. 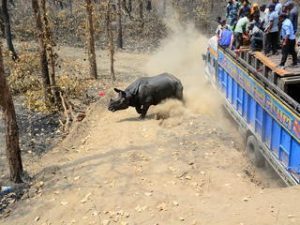 In the end, Mishra realizes the positive effects the public ceremonial death of a rhino had to ultimately increasing protected lands, jobs, foreign exchange, sustainable land management, and bolstering not only the reputation of the animal but also expanding the number of rhinos located in Nepal. Mishra, Hemanta. The Soul of the Rhino. Rowman & Littlefield, 2009. This entry was posted in Uncategorized and tagged conservation, rhinos, The Soul of the Rhino. Bookmark the permalink.